The European mink is smaller than its American relative, weighing up to 740 g (1.6 lb). It inhabits the densely vegetated banks of creeks, rivers and lakes. Its diet includes small mammals, frogs, molluscs, crabs, fish and insects. All mink species are mainly crepuscular and nocturnal. They are semiaquatic and swim and dive well. Their partly webbed feet are useful for hunting underwater. Mink species are solitary and territorial. 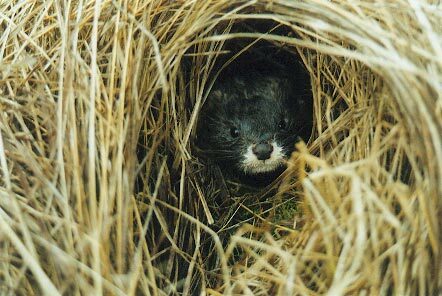 A mink may excavate its own burrow, take one from a water vole or establish a den in a sheltered location. The female usually has 4 or 5 young per litter. A century ago the European mink could be found throughout the European continent. It has declined due to hunting, habitat loss, water pollution and competition with the American mink, which was introduced into Europe in 1926 for fur farming. Currently, it is declining rapidly in Eastern Europe and probably exists in small populations in Spain and France. A century ago the European mink could be found throughout the European continent. By the middle 1970's, it occurred in the Soviet Union, Finland, eastern Poland, parts of the Balkans, Spain and western France. Currently, it is declining rapidly in Eastern Europe and probably exists in small populations in Spain and France. It is now extinct or greatly reduced over most of its former range (IUCN 2004) . Reasons for its decline include hunting, habitat loss, water pollution and competition with the American mink, which was introduced into Europe in 1926 for fur farming. 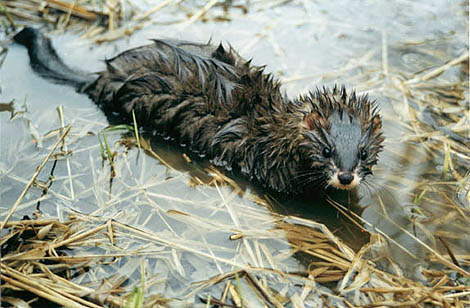 Competitive exclusion of the European mink by the American mink has been observed within 5 - 10 years on the upper Lovat River, a medium-sized river in Russia (Sidorovich, V.E. et al. 1995) . Up to 440 g (0.9 lb) (female) or 740 g (1.6 lb) (male). The European mink is found in the Caucasus and Mediterranean Basin Biodiversity Hotspots (Cons. Intl. 2005). 5 - 10 weeks (the variation may result from delayed implantation in some females). Mating takes place from February - March. Births occur in April and May. A female has 2 - 7 young per litter, usually 4 or 5. The female raises the young by herself. They are weaned at about 10 weeks. Dispersal occurs at 3 - 4 months of age. Males disperse farther than females, as much as 50 km (31 mi) or more. At least 6 years (12 years in captivity). The European mink is a carnivore. It eats small mammals (especially the water vole), birds, frogs, molluscs, crabs, fish and insects. Mink are mainly crepuscular and nocturnal. They are semiaquatic and swim and dive well. Their partly webbed feet are useful for hunting underwater. However, their eyesight is not well adapted to seeing underwater. Mink rely heavily upon their sense of smell when foraging for terrestrial prey. A mink may excavate its own burrow, take one from a water vole or establish a den in a sheltered location such as a crevice or among tree roots. It often stores food. Mink are solitary and territorial. A mink generally spends the summer in an area of 15 - 20 hectares (37 - 50 acres), but there may be extensive fall and winter movements to locate swift, nonfrozen streams (Nowak & Paradiso 1983) .